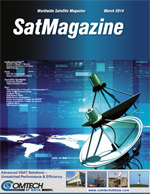 iDATE examines the threats and opportunities that face the satellite industry, from 2013 through 2017 and offer to assist readers in understanding the digital world that surrounds us. Congressman Mike D. Rogers (R-AL) recently published an article entitled, “Changing the Military’s Approach to Commercial Satellite Communications,” which was refreshing to see in that a leading member of the House Armed Services Committee was seriously addressing an important, if somewhat obscure, issue. Executive Spotlight: Dr. William E. Steele, Chairman & CEO, KenCast, Inc.
Dr. William E. Steele is the Chairman & CEO of KenCast, Inc. Prior to starting KenCast, Dr. Steele worked for GTE for 14 years, spending the last five as General Manager of the GTE ImageSpan division of GTE Spacenet. Chris Forrester met with Barrie Woolston, the Managing Director of Satellite for the United Kingdom (UK)-based transmission and teleport specialists, Arqiva, for a discussion regarding his view of the market. Predicting the market evolution for the somewhat longer term, all the while having to invest in what seems to be the most profitable option today, is challenging endeavor. Nevertheless, that’s what satellite service providers have to accomplish even more than often than ever before. In a world first, the underwater, shallow reef topography of the entire Great Barrier has been comprehensively mapped. This was made possible by satellite-derived bathymetry (SDB) technology. GaN based Solid State Power Amplifiers have extremely attractive properties (e.g., small form factor, high efficiency, high linearity wide bandwidth, and radiation hardness that make them ideal for use on ground applications as well as for space-based satellite communication systems. Small satellites ( smallsats) offer a unique combination of scaled down size, costs, and time to deploy. But what of the other components that make up the smallsat mission? Can command control (and ground segment management) be delivered with the same cost advantages that make smallsats so attractive in the first place, without compromised functionality? As the leading professional content management event in the Middle East, Africa and South Asia (MEASA), CABSAT has well-established roots as a conduit for facilitating and sustaining the industry’s regional growth. Today, more than one million households access the Internet via broadband satellite. A new satellite generation with 10 times more capacity will catch three million users in the coming years. Jim Clarke is Head of Global Wholesale for Telstra Global, based in Hong Kong. With over 15 years of experience in the telecommunications industry, he is responsible for driving sales strategy and business development for Telstra Global’s carrier wholesale team, across Asia, EMEA, Americas and Australia. With the one-two punch of the recent Super Bowl and Winter Olympics in Sochi occupying a great deal of broadcaster attention, 2014 continues to shape up to be an upswing year for the contribution and occasional use (OU) satellite TV markets. A New Name For The Premiere, International Space Industry Event, The 30th Space Symposium will be held May 19-22, 2014, at The Broadmoor Hotel in Colorado Springs, Colorado, USA.